Remember in my FreeBEE Friday post last week I shared a little bit about Gods World News? Well guess what they replied to my email and told me that my readers could call them at 1-800- 951-5437 to request samples so you can find out for yourself what I am talking about. Let them know grade level you want and they will send them to you. Mention my blog please when you call. These magazines are amazing. I almost didn't pick up the FREE samples at GHEA because they didn't look like something my kids would be into. But boy was I WRONG and glad that the two people working the booth insisted. They informed me that they had one for kids in Pre-K so I pick that one up as well as a 1st-2nd grade copy. These magazines are filled with all sorts of amazing things. As my kids flipped through the pages looking at the pictures they were filled with all sorts of questions which lead to some great discussions. 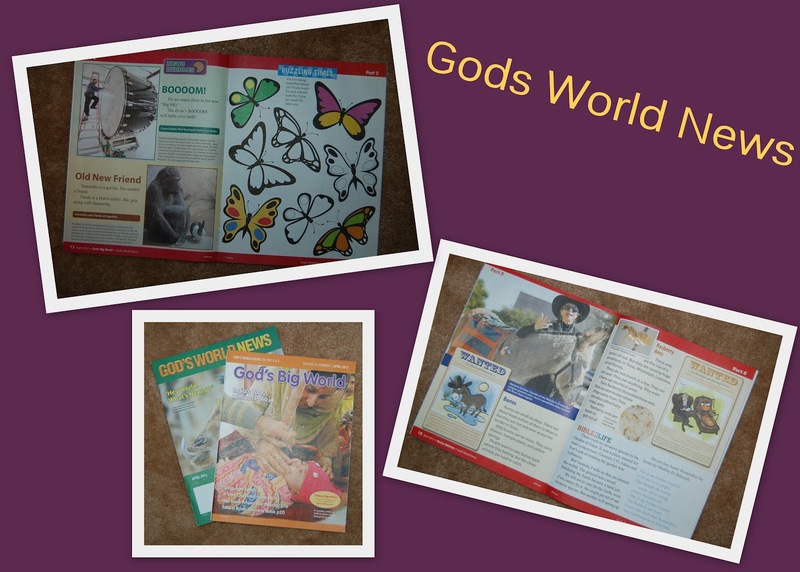 The samples we received had great short articles, amazing bible verses and fun activities. We learned about mission trips to India to provide polio vaccines for the people. And we learned all sorts of amazing facts about Gods marvelous creatures. Under almost every article is a teaching tip to assist parents with further discussion about the topic. Sometimes there are even links to websites where you can learn more about the topic and watch videos. I was told that these can actually be used as a social studies curriculum in itself or used in conjunction with your current curriculum and I can totally see why now. Gods World News has several great FREE resources on their website including lessons, biographies, explain it, today in history, news now and more. There are six levels from Pre-K through high school, each version touches on core subjects to help students develop the critical thinking they need to make sound life decisions. Economics, science, religion, history, media… it's all current "real world" material and all prepared for you. And best of all the current events are presented to children using a biblical worldview. Full-year subscription includes 10 big, full-color, monthly issues (every month except December & May). School-year subscriptions include seven monthly issues (September - April). 24 pages per issue, filled with age-appropriate news and activities. MAP-IT! Locator maps correspond with a full-sized (20" x 30") world map sent at the beginning of the school year to each class, homeschool teacher, and homeschool group coordinator (five maps sent to homeschool groups). Check out a FREE sample PDF issue here. You can subscribe to God's World News here. Price is $24.95-$27.95 for a 10 months subscription. ALSO if you decide to order a subscription do so before June 30th and get 15% off with code N2C15GHE when you call or visit this link. Man! I didn't realize they had free samples at GHEA. I'm gonna have to call and check it out!